We’ve always had a crush on block print fabric: The pretty details, intricate patterns and natural colors make our hearts sing! On our last trip to India, we had the opportunity to visit our partner’s facility in Rajasthan and get a glimpse into their handmade process and amazing personal story. 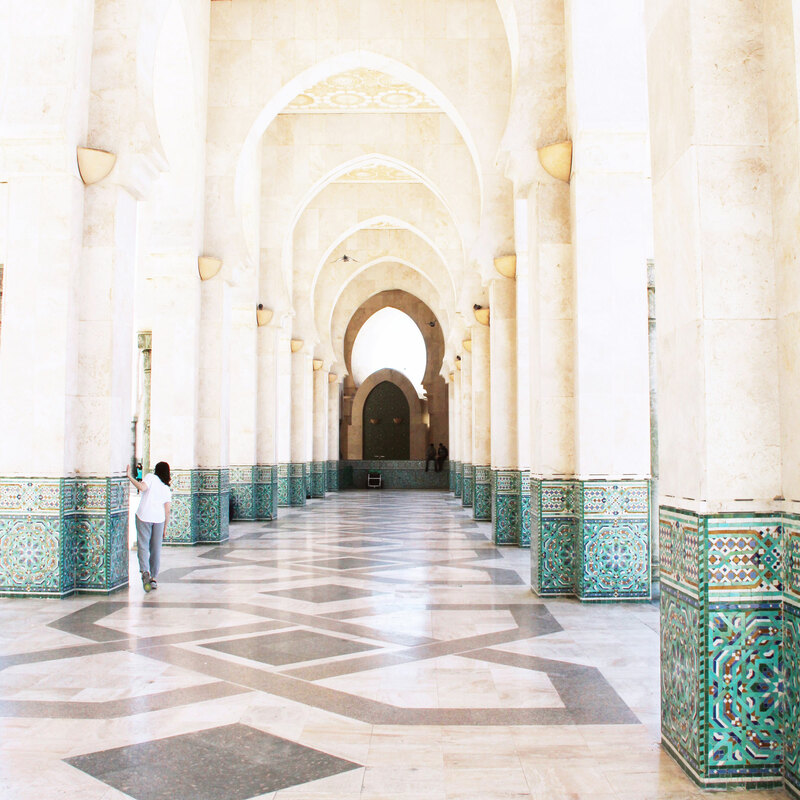 Their incredible history is one of resilience and determination and we hope you get a taste for the skill and artistry that goes into each piece. Completed block print textiles stack on floor-to-ceiling shelves in our artisan partner’s studio space. Our artisan partners are a small, multi-generation family-owned operation in the northwest Indian state of Rajasthan. They started as a business of buying and selling textiles from regions nearby such as Gujarat and Punjab as well as the Pakistan border. Later on, they brought in master block print artisans and started to create and sell their own designs locally in Rajasthan. They were in business for more than 25 years when a massive fire broke out at their facility. The fire took everything they had; there was no insurance and in a matter of a moment, everything they had built was gone. Undiscouraged by this devastation, the family pooled their resources and began to confidently rebuild. 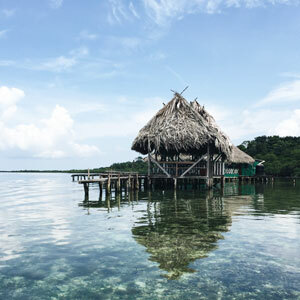 In one of the most epic comeback stories we have ever heard, in just a few short years they built their new business from scratch to become bigger and more capable than ever before! 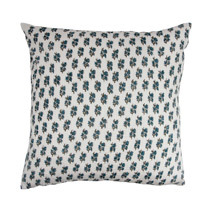 They now have several outlets in their town and are renowned for their hand block print fabrics and textiles that are produced entirely from start-to-finish in-house. 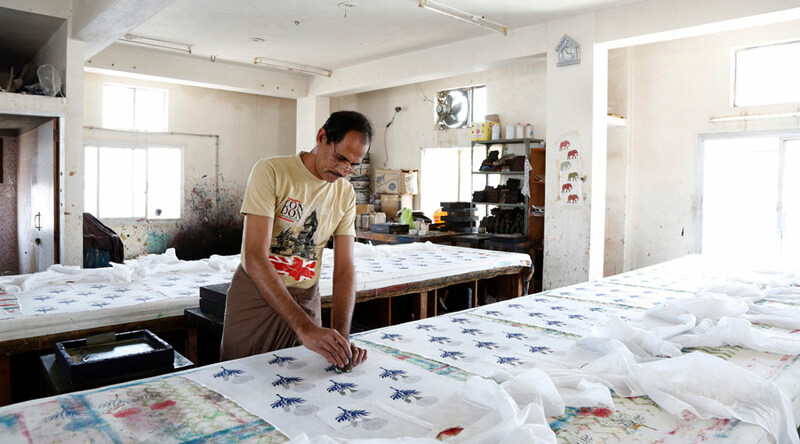 Our block print artisan’s main workspace is a multi-floor warehouse outside of the main area of town. Each floor of our artisan partner’s warehouse has a different function that speaks to the complex process of block printing. 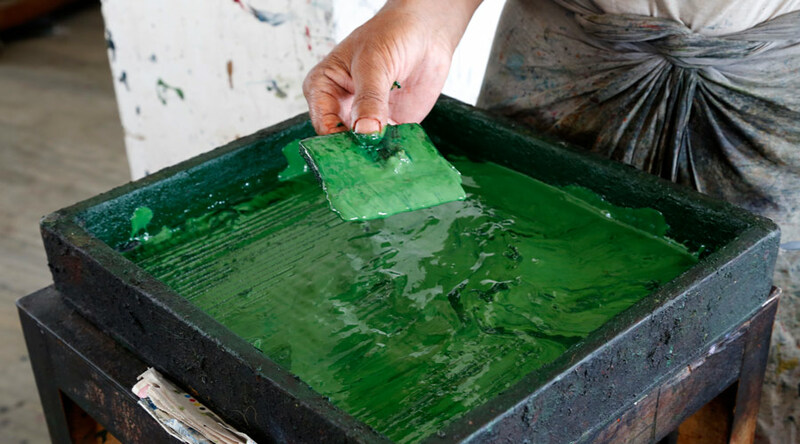 At the very top, the printers work bathed in sunlight to mix paints, prepare the blocks and fabrics, and do the actual printing. 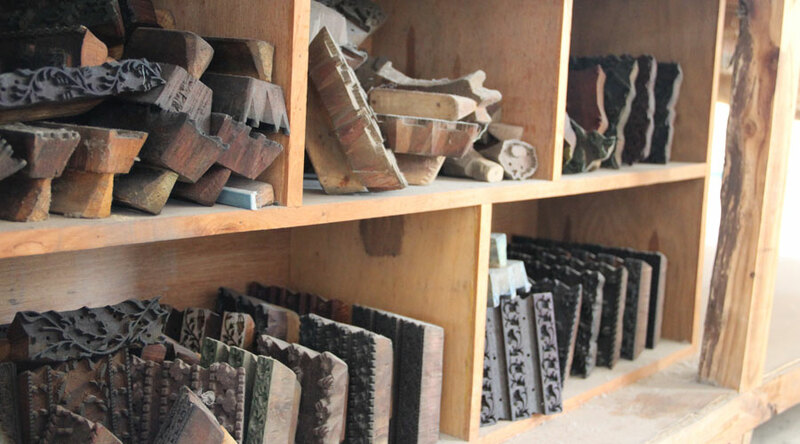 The blocks are hand carved by a group of artisans outside the city to the specifications of the printers. Our artisan partner told us that they have tens of 1000s of blocks in their collection and get huge bundles delivered on a daily basis. Each block is carved from a solid piece of locally sourced wood. The patterns found on a block are often not what you ultimately see on a finished piece – fragments of patterns are often combined on the fabrics to create the layered and multi-color look you see in more complex block print patterns such as botanical prints. Shelves featuring hundreds of hand-carved blocks line underneath every work surface and on every wall in our block print artisan’s studio. Block printers are traditionally roles for men in this region. Skills are passed down from father to son and many printers come from families who have created block prints for multiple generations. To create a print, the artisans traditionally work with stretches of fabric affixed to wooden work tables several yards long. Starting at one end, the artisan places the well-inked block down in its desired spot and pounds on the block with his fist creating a loud knocking sound. He does this as many times as required to put down the first layer of the pattern and works through the length of the long table. Designs that contain multiple colors or complex images often require several different blocks (and trips down the table) to complete the pattern. His work commands an incredibly steady hand and a precise, repetitive movement to execute a master-level block print. A master block printer adds a layer to a complex floral pattern. 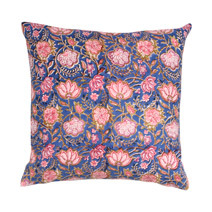 Every print uses natural dyes that are mixed by hand in the artisan’s studio space. Each hue is mixed separately and in small batches. All of the natural dyes are mixed by hand before they are used in the block printing process. 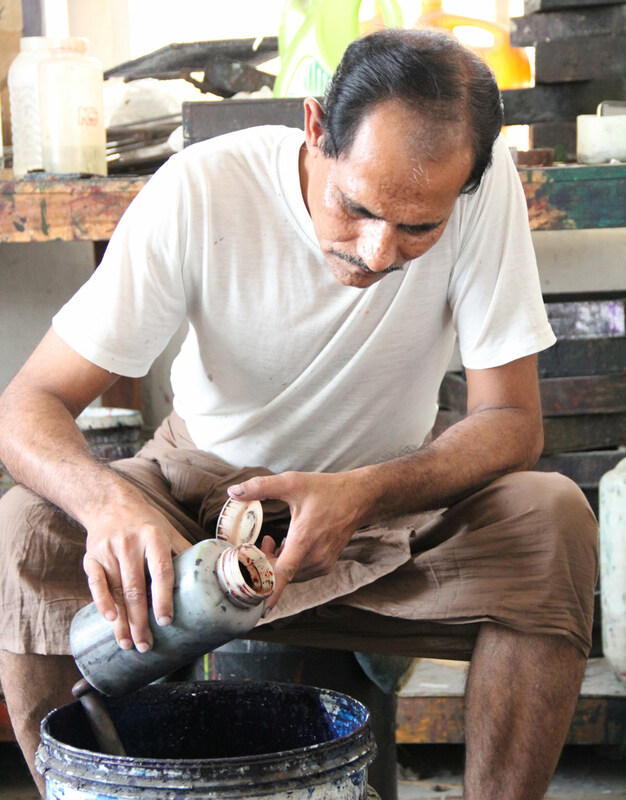 Dyes are transferred to a wheeling side table that the artisan pushes around the studio as he works. 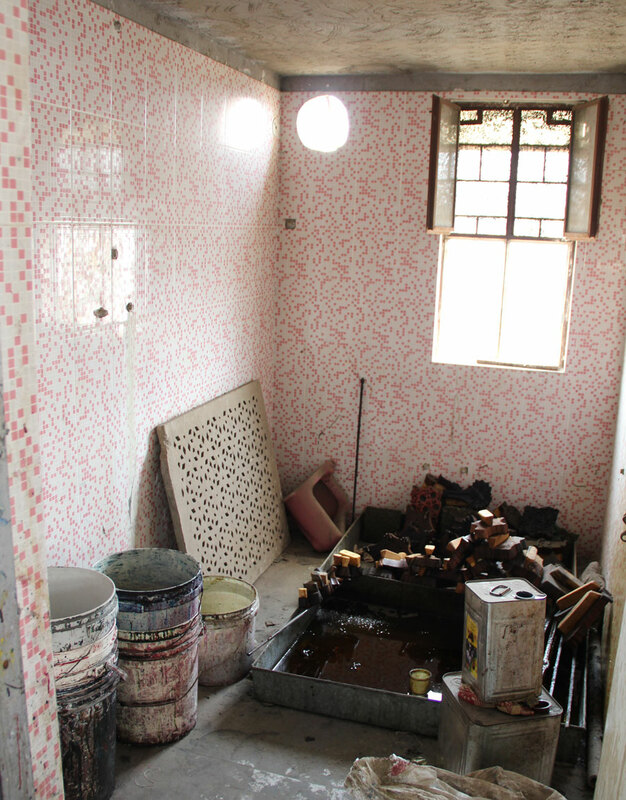 This is the area where the block print artisans clean the blocks after they have been used. Other floors of our artisan partner’s facility are used for housing completed work, vintage textile collections, and outgoing shipments. There are literally piles of textiles everywhere. 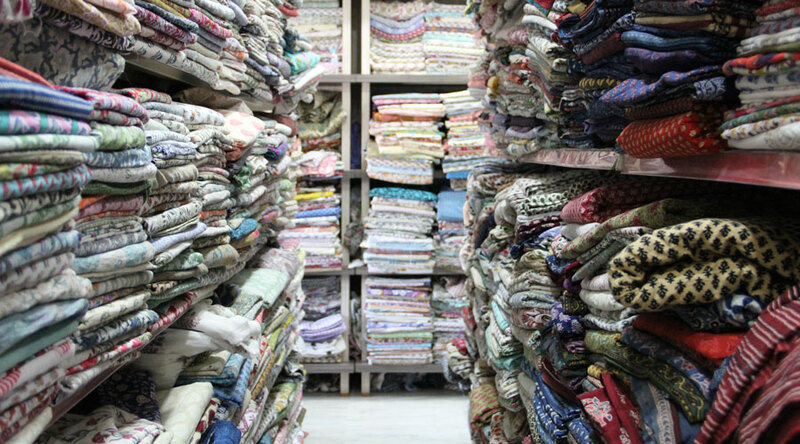 For a lover of textiles, this place is the equivalent of a chocolate lover visiting Willy Wonka’s factory! 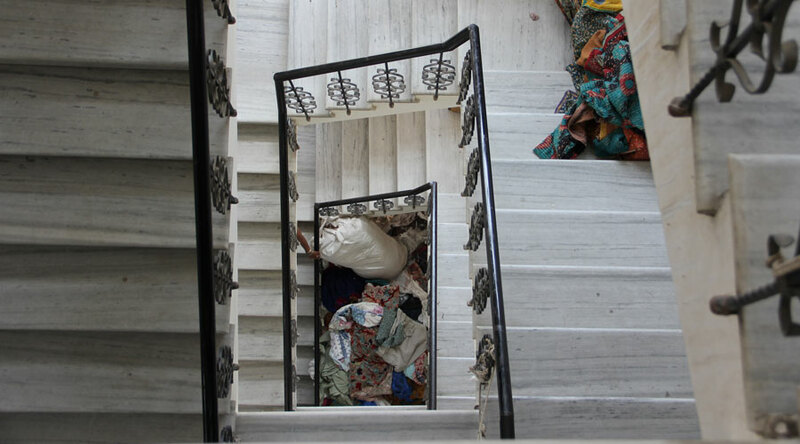 An avalanche of vintage kantha quilts basks in the sunlight on a stair landing. 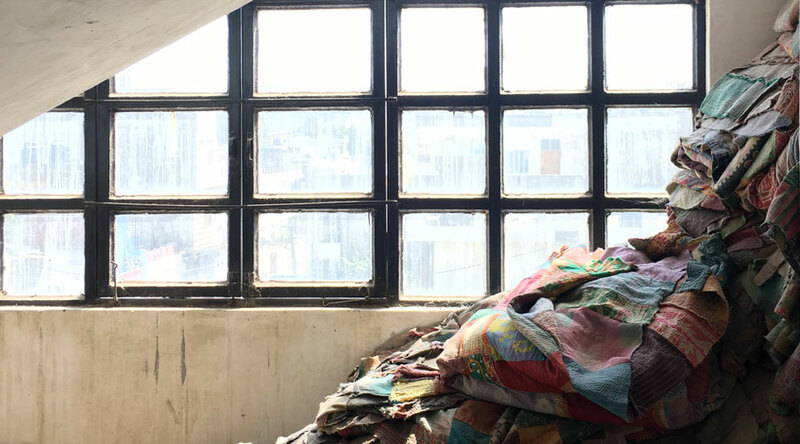 The first few floors of our artisan partner’s warehouse are home to cutting, sewing, and finishing work. 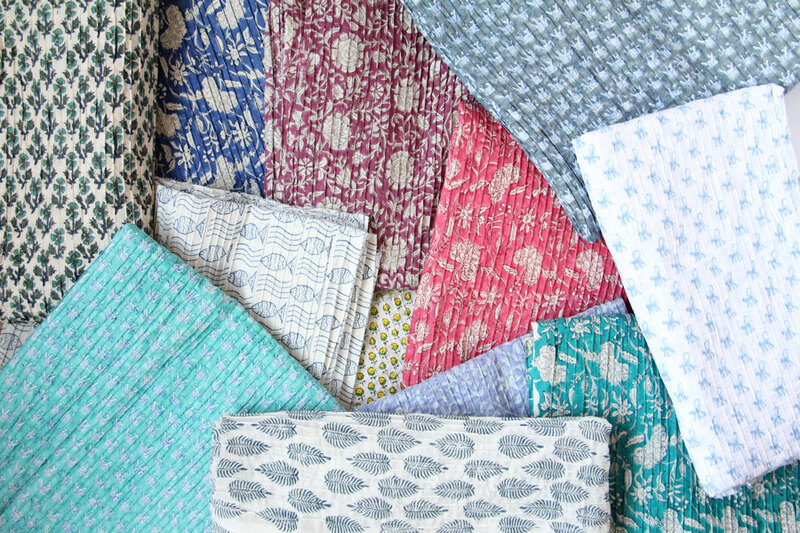 Our block print napkin collection is cut and sewn at our artisan’s facility. 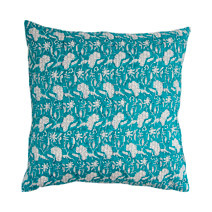 (Our block print pillow collection is printed exclusively at this workshop, and cut and sewn in the United States.) 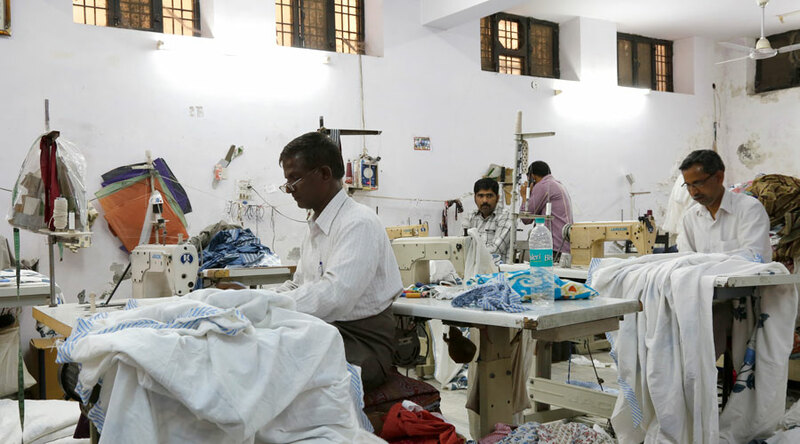 In Rajasthan, the men are the ones who do large scale cutting and use the sewing machines, and the women are responsible for the specialty handiwork as well as quality control. The sewing room is a busy place full of several rows of machines all buzzing together as they stitch and seam everything from small napkins to large scale blankets and sheets. This master artisan is in charge of the cutting room. He uses hand-forged scissors to cut fabric before it is passed on to the sewing team. These women are completing the finishing touches on a hand-stitched kantha blanket. 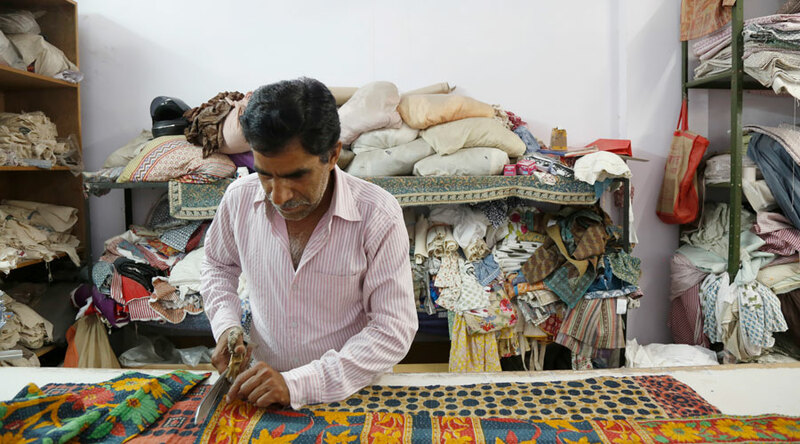 This artisan works to complete the final stage of sewing on a piece of clothing. We loved getting a glimpse into our artisan partner’s bright and colorful workshop space. To think that a handful of years prior to our visit they had lost everything! What they’ve been able to create is truly remarkable and we are so happy to be able to feature their detailed and special work here at Meridian.